On Thursday, May 31, 2018 the Rotary Club of McHenry held its regular Club meeting at McHenry Villa. Club Member Bob Blake is a resident at McHenry Villa; we held our meeting there to facilitate Bob’s participation. 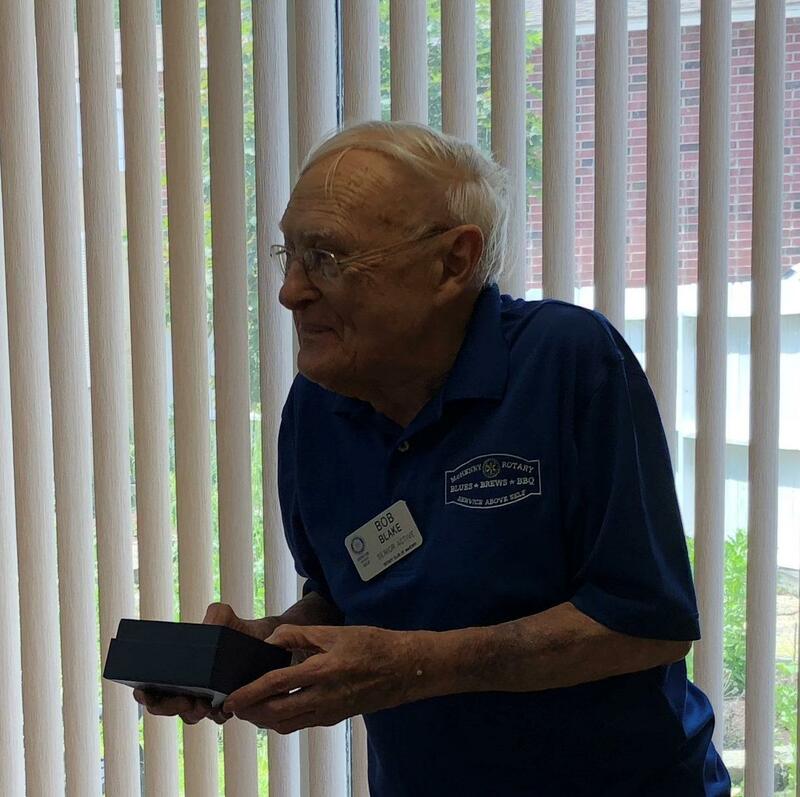 We also presented Bob with an award expressing our appreciation for Bob’s more than 63 years of dedication and service to the Rotary Club of McHenry and the communities we serve. Bob joined our Club on April 12, 1955 (the date on which our Club was Chartered). He has served our Club and shared community for over 63 years. Bob, thank you for all that you have done for our Club and community, as well as the fellowship we share. Don Doherty (Bob’s good friend, a former Rotarian and a former Mayor of McHenry (1961-1973)) joined us in expressing our thanks and appreciation to Bob. Pictured below from left to right are: Lori Lowe, Phil Bartmann, Karen Lavin, Bill McLemore, Don Arvidson, Bob Blake, Craig Adams, Ron Newman, former Mayor of McHenry (1961-1973) Don Doherty, Tom Webb, Tony Huemann, Denis Buch (Club President), Denny Welter, Terry Hargrove, Don Tonyan, Sr., Barb Swanson, Ron Bykowski, Dawn Cassiday-Turner, and John Halbleib.